The design with the help of balls is important for any holiday, not just for weddings or kids birthday parties. 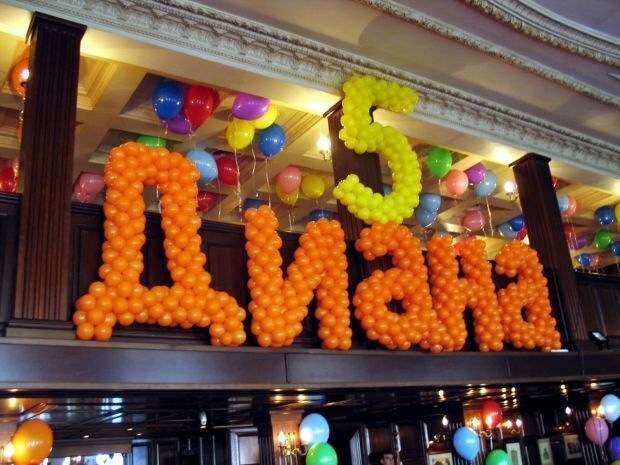 Especially advantageous to look figures made of balloons, for example, in honor of the anniversary. Such a beauty you can create with their hands. Plastic pipe, tape, scissors, balloons. In order to make the number of balls, it is first necessary to make a skeleton. For this it is convenient to use an ordinary tube of plastic. If at hand was nothing in it except wire, as a skeleton you can use it, but plastic pipes are much better keep their shape. Run frame in the form of required numbers. If it means that the next figure should stand on the floor, it is necessary to make a stand-the base, below the figure did not fall. For a safe design it is necessary to firmly connect the main frame with stand with duct tape. Now you can start inflating the balloons. In order to make the balls last longer and don't burst, they need a little stretch. To do this, inflate the ball, then let him some air, only then neatly tie. Try to get the balls about the same size, otherwise there may be problems in the manufacture of figures. After you inflate the required number of balls, tie them in pairs first, and then connect the four things. For this loop the two pairs together. Most importantly, you must attach the resulting four of the balls on pre-made frame. To start doing it better from below, paying special attention to hard to reach places. First decorate the base of the structure, it is possible to use single balls, it all depends on the size of your stand. Then you can move on to the figure. Gently and evenly Obratite frame prepared in bundles on four balls. To the edge of the pipe could damage your balls, seal it with tape. On the tips of the digits it is convenient to use chords in four balls and five. That will look neater. If suddenly the balls in some places do not wish to go in the right direction, it is possible to fix them using double-sided tape. The color of the balls should be in harmony with the other elements to be used for the decoration of the room. If numbers are very large, the balls will need a lot, so in order to save time and effort more convenient to use the pump to inflate. Decoration of inner premises, outdoor landscape space is called aerodesign. 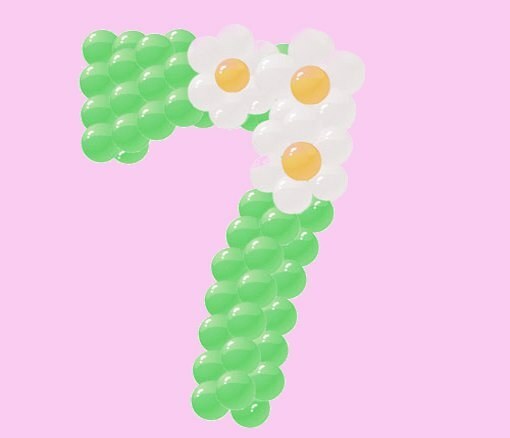 The main element in the flyer are considered to be balloons of different shapes, colors and sizes. Both beginners and experienced artisanry know how to make figures out of balloons. These balloon figures perfectly complement the party decorations. balls green and any other color size "5"
In the estate there are several ways of making figures from balloons. So that's the most common way you can make any number of small round balls that need to be inflated the same size. If you make the balls the figures for the first time, be sure to tell the seller of balloons that you are going to have children. The seller will select for you the balls required strength, roundness and size. In our case, you will need 5 balls of the size. On both pieces of cable with two sides fold the loop so that the beads are subsequently off the frame. From the longer cable, Flex the digit "2". The shape of the cable will be its base. Green balls make a clearing. This twist between 4 inflated ball. These twists are called "primitives". See primitives into the clearing. All you need for the entire frame opening 16 of the primitives. Place green finished the clearing on the floor. Now start making the digit "2" of the balls fifth the size of any other color, for example red, pink or blue. It will need more primitives than on the meadow. Now it is time to hoist the resulting "d" of the balls in the fruit bowl and tie it to her line. The height of this aerocrine will be up to 1.40 meters. You can further decorate the number in its sole discretion. Different elements for the decoration of the compositions of the balls attached to them with glue gun. 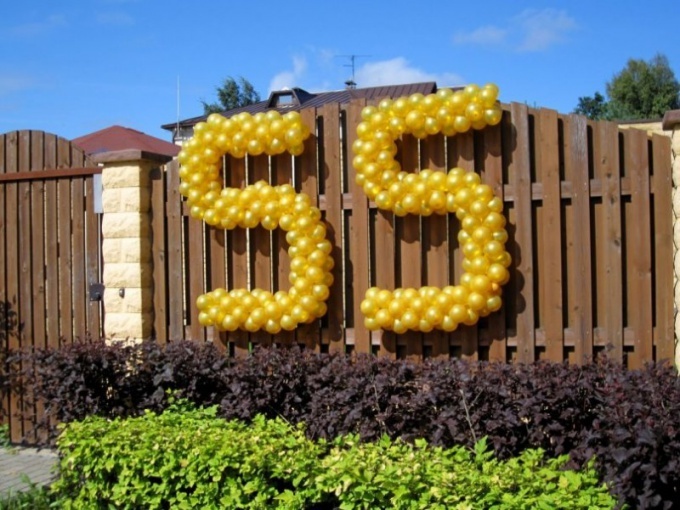 Numbers of balloons can be strengthened both on the outdoor grounds, and on the walls with the glue gun. The Drapes of the figures hung by fishing line, strong threads. In preparation for the celebration of an important event in the life of a loved one, many tend to decorate the room in which the planned celebration to show your loved one the significance of this day in their lives. For all kinds of commemorative dates perfect figures made from balloons. The first step is making the frame. As a material suitable thick wire or plastic pipes. It is important to be able to make the basis for your numbers. Better to give preference exactly to the pipes, as made of them the writing holds its shape better. Decide whether to stand the figure on the floor, table or you hang it on the wall. In the case that the product you will need to put on the floor, make a stand, to which can be attached to the frame. Bend the pipe or wire in the shape of the desired numbers and firmly attach to the stand with duct tape or some other method. Prepare the balloons. They need quite a large number. The figure can be made in one color and can be mixed or combined from two colors. Slightly pre-stretch the balls with your hands so they do not burst during inflation. Inflate the balloons not too large and firmly tie them thread. It is important that the beads were of approximately the same size, otherwise the figures are rough and not very accurate. Connect the two balls, firmly linking them to each other. Then combine two pairs to form four. Work blanks, which are then attached to the frame. Starting from the bottom of the frame, try to fix it prepared four balls. Very carefully obtrusive billet numbers balls, fixing them on the basis of plastic tubing. The sharp edges of the frame, wrap with tape so they couldn't damage the balloons. At the ends of the figures fasten bundles of five balls to give the structure a finished, streamlined look. Don't worry if some balls will not go smoothly. You can attach them with a small piece of double-sided tape. Decorate the stand. This can be done not only bonded by four and separate the balls. It is best to highlight it in a different color. For example, green like a clearing, or blue — sea. 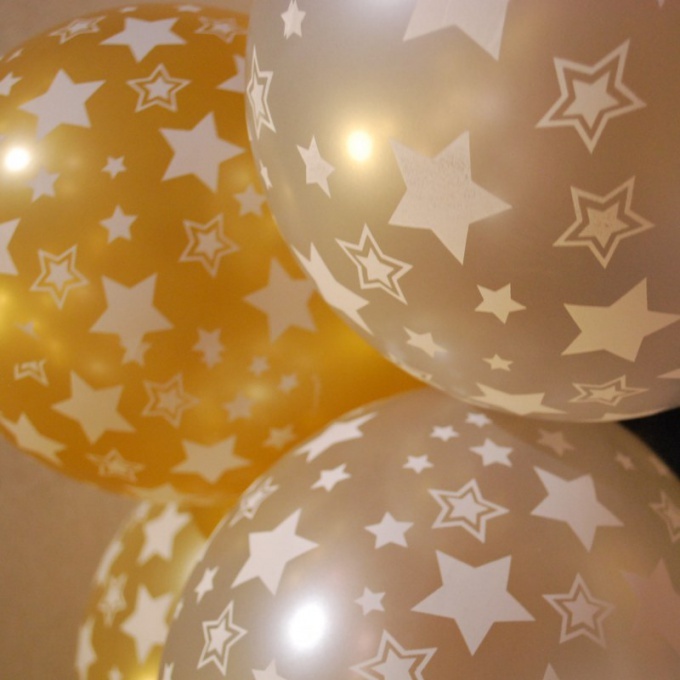 If the numbers of the balls is very necessary, but doing them no time can be ready to buy foil balloons in the form of the desired numbers. Inflate them with air or inflate with helium. Tightly tie rope and attach in the room. However, in this case you will be limited in choice of color and size, because most often, these balls are available in two versions — 20 cm and 86 cm in height.